In the last couple of weeks we have had our vacuum cleaner and clothes dryer break. At first I did not think I could move on. Is the another way to get the dirt off the floor? I have realized how much I rely on that little plug in the wall. So many things that we do everyday require us to plug them in, including the computer I am writing this on. But have you every stopped to think about what you could “unplug” and “do things the old fashion way”? So in the last two weeks I have unplugged my clothes dryer, my coffee maker and my vacuum cleaner. It has taken a while to get used to it, but I think I like it better this way. I make my coffee every morning using a tea pot and a coffee press. The coffee has amazing flavor and I can reuse the grounds for afternoon ice coffee. I do not miss my coffee maker at all and I do not think that I am going to go back anytime soon, if ever again. The next thing I changed was I stopped vacuuming. This has been difficult. We have 4 cats and 2 dogs…hair is a major part of my life…it is everywhere. The good thing is I have hardwood floors and I am able to sweep up most of the hair. My challenges have been area rugs, furniture and dusting. I never realized how much I “dust” with the vacuum cleaner. So I have gone back to using a duster, and beating my rugs and pillows outside. I am still looking for ways to get the hair and sand out of the couch if you have any suggestions, but all and all, I am getting along fine without the vacuum. Last thing that I unplugged was my dryer. Well, it kind of unplugged itself. It stopped drying, my husband can fix it but the parts cost as much as another used dryer. I decided to try and go the rest of the summer without it. To help support me, my wonderful husband built me a clothes line out of pallet parts. It is wonderful! It is almost 200 feet of drying area, I love the location in the yard and my sheets feel and smell great. We also have a small stand style clothes rack in the basement for the things I don’t want to air dry in-front of the neighborhood. Between the two I feel that all of my clothes drying needs are met. My husband calculated that we will save $30 a month by not using the dryer…I am excited about that! I am going to use that money to support a child through World Vision. So far I am enjoying unplugging things. I challenge you, what could you do “the old fashion way”? What could you unplug? We have finally taken a step to following our aquaponics dream. Some married couples go away for weekends alone, some go to marriage retreats, some go to marriage counseling…we build a green house. We decided to buy a kit instead of building it from recycled materials like we had planned. We knew time was short and we wanted to stop procrastinating. We bought a 12 x 10 foot greenhouse from Harbor Freight. It took us 3 evenings and 1 full day to put it together. It was not a labor intensive project, it was a test in patience and teamwork, which I think we passed with flying colors. After 6 frustrating months of not feeling like we had accomplished very much, it was very rewarding to build something together and have a feeling of accomplishment. There are a lot of blogs about putting together this greenhouse out there… I think our only comment on the process is go slow, don’t skip steps, read the directions and be patient. Here are some pictures of the project and it came to life. Thank you to everyone that is helping us to make this a dream come true. I started planting in February. Seeds, flats, transplants and grow lights. My spring harvest was a complete flop. (I am blaming my chickens… I need to work harder on chicken proofing the gardens next year) I did not get any of the broccoli, cabbage, lettuce or cauliflower that I had planted. Now that summer has come I am starting to harvest things and it really is rewarding. We planted garlic in the fall and I have been harvesting garlic shoots off of it and using them when I roast chicken and beef, all the while patiently waiting to pull the garlic out of the ground. Yesterday I had my 15 minutes glory, I pulled 25 heads of garlic, pretty good for my first attempt I think. I am drying them on top of the hot tub cover I look forward to braiding the stems in a couple of days. The other big harvest that we have had is potatoes. Being able to grow potatoes made me feel like a real farmer. I don’t know why potatoes made the difference and not the chickens but anyway, we harvested a bucket of potatoes, (red, white and Yukon golds). I cleaned them in vinegar water and look forward to eating them over the next couple of weeks. I have posted some crazy pictures of our potato “journey”. For a while this spring we were not sure if we would be moving or not. My husband was jobless and we knew we would have to go where ever there was work. So I did not plant as much as I would have if I did not have that time of uncertainty. While I was packing boxes in the basement I checked on my potato starts that I had been saving since fall. Oh My!!! 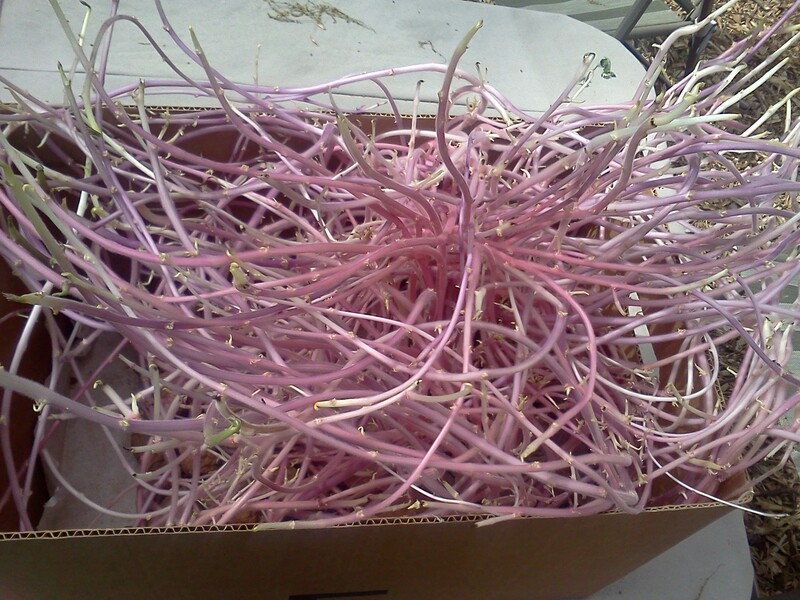 I was shocked to find a box of potato shoot spaghetti. With the warm winter the potatoes were growing like crazy in that box. I had to plant these potatoes. 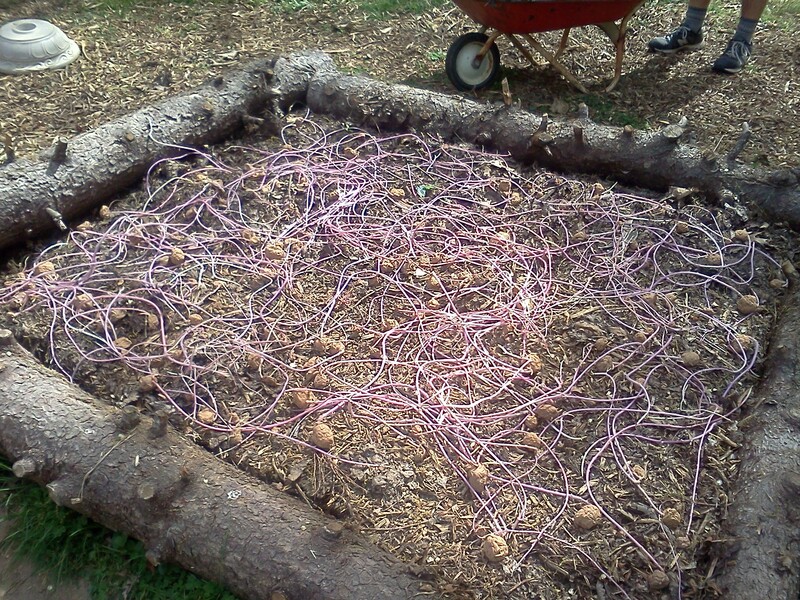 We laid them out the best that we could in this bed… there was nothing organized or row like about it, and covered them with compost and mulch. I honestly did not expect anything to grow. Within a week, we had a very happy little potato patch. Well it was happy when it was not getting eaten by chickens, but that is a different story. A week ago, last week of June, my potato patch started to turn yellow. I thought that my plants were dying and that I was doing something wrong. 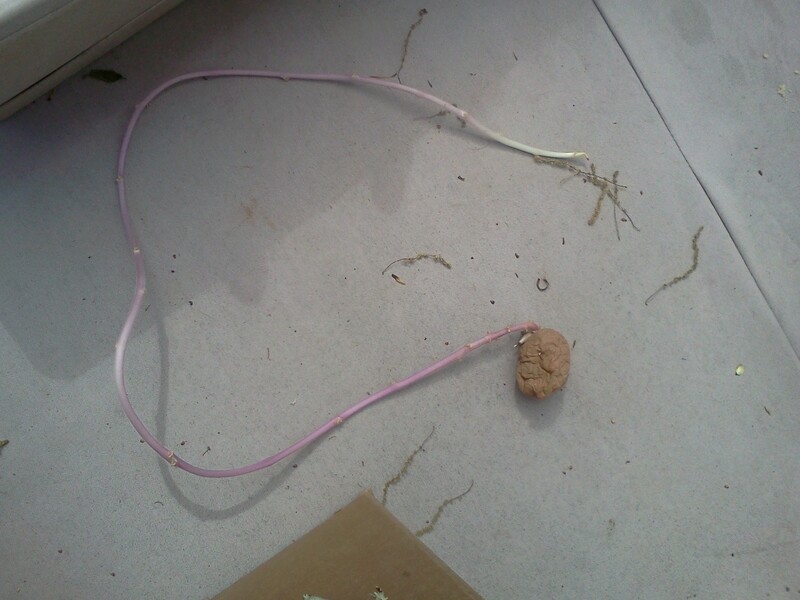 When I pulled up a plant just to prove that it was dead, a string of potatoes came up with it. It felt amazing. I stopped everything I was doing and spent the next hour gathering potatoes from this patch. And also to my amazement, the chickens actually came in handy. I had spent most of the last two months trying to keep the chickens out of this potato patch. When it came to harvesting the potatoes the chickens would dig the potatoes up for me and I would just have to gather them… it is was nice team work. And once I found the snake my son was more then happy to help too, in hopes of finding another snake. Two first for us, potatoes and garlic. It was pretty cool. I am learning so much and having fun along the way. I still can not believe how you can put this small wrinkly thing in the ground and end up with food, but it is amazing to watch and be a part of.